Dragonlance Tales Volume 1 by Margaret Weis and Tracy Hickman, Sci Fi. Book is in good condition, all pages intact. 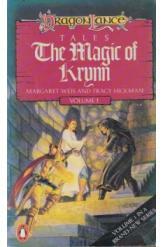 A collection of ten short stories about the world of Dragonlance, by Margaret Weis and Tracy Hickman. Incudes "The Blood Sea Monster," "Love and Ale," and "The Magic of Krynn," among others.